Are you worried about the impression you'll leave at your interview for PA school? Not sure if you can secure your spot? After submitting your application for physician assistant school, the interview is next. Does the thought of a face-to-face encounter that will decide your future scare you? Are you worried about saying the “right” thing? You’re not alone. In Physician Assistant School Interview Guide, Savanna Perry, PA-C walks you through the steps of taking control of your interview and using your personal accomplishments to impress your interviewers. Acceptance to PA school is becoming more competitive every year, and this book will provide the tools to ensure you join the ranks. This interview is your chance to impress your future alma mater and move one step closer to becoming a PA. This book is the key to help you reach your goal. Part I addresses PA school interview preparation techniques and everything you need to know before your interview. Part III includes advice for after your interview, an FAQ, Interview Preparation Worksheets, Mock Interview Guide, and a Master List of over 300+ questions! 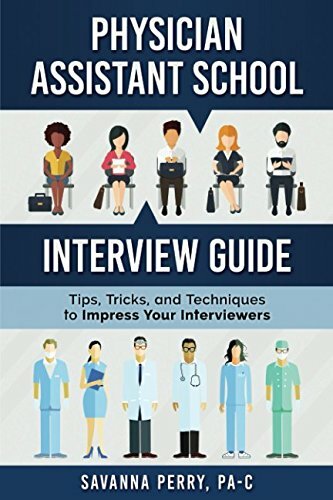 If you're ready to take control of your PA school interview and move one step closer to achieving your goal of becoming a physician assistant, snag your copy today! Is your Pre-PA Club interested in a discounted bulk order for your members? Enter your contact info below!